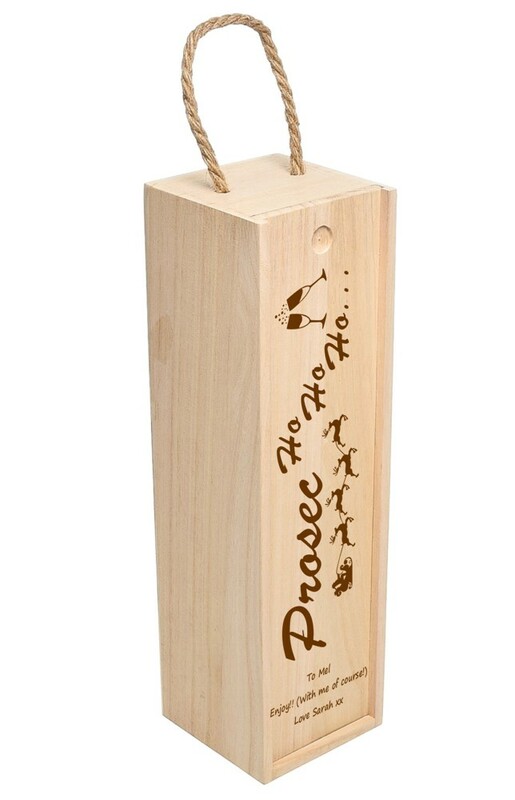 Personalised Engraved Prosec Ho Ho Ho Wooden Wine Box. An amazing pine wooden wine box with sliding lid. It measures 35 x 10 x 10cm and has a rope handle. The internal size of the box measures 33 x 8.5 x 9.5cm. All you need to do is let us know the personalised text you would like engraving. As standard the box includes all the images shown and the set text of 'Prosec Ho Ho Ho'. Please note each box is made from natural wood and may feature small imperfections and differences in grain, knots and colour.